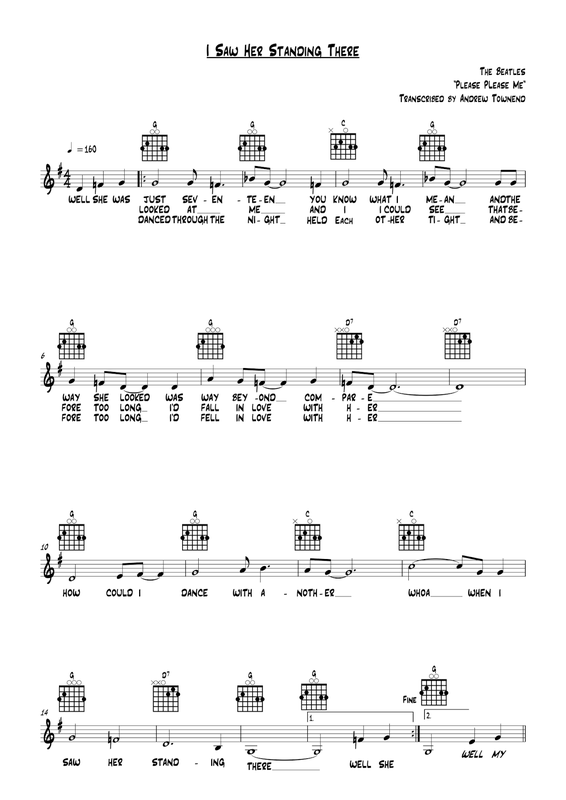 Here's a song sheet for I Saw Her Standing There by the Beatles. It's hard to say how much I've enjoyed listening to Beatles records over the years, quite a lot I reckon. When I was up in Liverpool for a few years myself I had a rehearsal with a couple of guys who wanted to recreate the Beat sound of the 60's and I had to learn all these songs in a short space of time because they wanted to play the Matthew's Street Festival. It never did happen but I came away knowing a tonne of these Beat songs like Shakin' All Over, Lucille, Roll Over Beethoven, Needles and Pins, Mr.Postman, When Will I be Loved, Your No Good, Love Potion No. 9, Rock and Roll Music... there is more... I just opened my old diary to remind myself! The great thing about a lot of these songs are they are built on three chords, really nice and easy to learn, and they are so much fun to play with a 4 piece band. This song has about 3 chords I think, the trick is knowing which order they are in. Enjoy.